Dsquared has become a highly profitable brand and the counterfeiters are making D2 knockoffs of everything from jewelry, to bags, to underwear. Yeah... fake underwear. Here are some real vs. fake comparison photos of a Dsquared bag. Of course, this is just one example but the details below hold true for all styles. As this blog grows I will post more examples of different styles. First, you can dismiss the color difference in the handle. This bag was produced in two versions, one with the red handle and one with the tan handle. Below, is a photo of an authentic red handle bag on the runway. It is very hard to tell the real from the fake in the first comparison photo, so, as usual, the key lyes in the details. What is apparent from this first photo is the difference in quality of the denim. In the photos below you can also see the difference in quality of the leather trim. The stitching is the give away in this example. Knockoffs often have crooked stitching that does not run parallel to the edge of the material. You will also notice that the stripes of the fake are skinnier and there is no "Genuine Leather" or "Made in Itlay" on this fake example. Now here we're getting into minute details, but, the studs on the bottom of the authentic bag are more rounded than those on the fake bag. Also note the shape of the leather around the inner zipper and the length of the inner zipper. John Galliano jeans vary in style and cut, and this is a comparison example of one such style. The most noticeable difference between the fake pair and the authentic pair is the location of the Galliano logo patch. This logo patch should be located either on the font of the thigh or the side of the jean (as pictured), but never on the back of the leg as seen in the fake example. The authentic patches have some variations as well. Some are a smooth leather material and some are a textured suede material. However, the fake patch in this example is too wide and the logo is too large in comparison to the authentic patch. Furthermore you can see the stitching swerves a little along the top of the fake patch. The straightness of the stitching is always a key to authenticating an item. The quality of the stitching speaks to the skill of the people who created it. 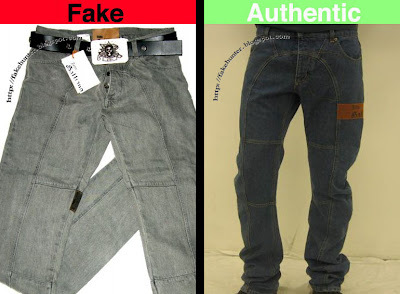 Most fakes are made in sweatshops by underpaid and under-skilled laborers. Galliano's men's line is not produced by Ittierre Spa. To the best of my knoledge it has only ever been made by Gibo' Co. Spa., who's tags usually look like the example on the right. Some of the auctions on eBay for fake men's Galliano clothing have pictures of Ittierre Spa. labels. Why? Ittierre does produce women's prêt-à-porter. You'd think the counterfeiters would at least try to get their labels correct. They probably just had a surplus of these fake Ittierre labels laying around the factory and decided to put them to good use. Some of the fakes do have the the proper style label but the labels are still different from the authentic ones। In this example the print quality of the fake text is poor. The letters are very bold, as if the printer was laying on too much ink and the spacing and formatting of the text is a bit off. This fake does not have "Gibo Co Spa" printed on it (which is the production company of authentic men's Galliano). Some of the authentic labels are missing this too (such as the first example above) and I believe it is because they didn't print it on the labels of pieces from earlier collections, but I'm not sure. 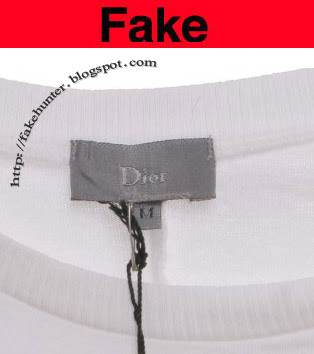 If you ever see the size tag connected to the silver Dior Homme logo tag, it's a fake. The authentic size tags are sewn either in the collar (not connected to the logo tag) or in the side seam with the fabric content label. Some of the fake Dsquared shirts out there have incorrect size tags. In shirts, this tag should be a light grey color and it should come out of the left side of the black Dsquared2 logo tag. The size tag should stick out ruffly half an inch and it should be just a little over a quarter of an inch tall. The authentic size tags vary slightly but they all keep to this approximate measurement. 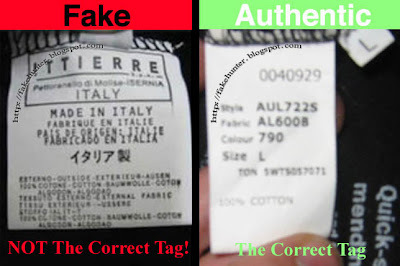 If you see a size tag that looks odd, chances are the shirt is fake. Keep in mind that some of the fake shirts do have the correctly proportioned size tags so an authentic-looking size tag does NOT guarantee an authentic shirt. The example above shows a fake black size tag. A large percentage of the fake Dsquared shirts on eBay have this fake black size tag. It is coming out of the right side of the logo label (not the left side, as it should). This fake tag is black instead of a light grey, and the sizing letter is on its side. The authentic Dsquared size tags always have the size positioned straight up, never on its side. The letter should be in a normal typeface, not bold, as seen in the above comparison photo. The authentic tags can vary a bit in length depending on how they are sewn in but the fake one above is extra stubby.